With more than 90 percent of businesses in the US using cloud infrastructure, the features they value, the challenges they consider most prominent, and the amount of money they are willing to invest in cloud computing are important factors to understand. 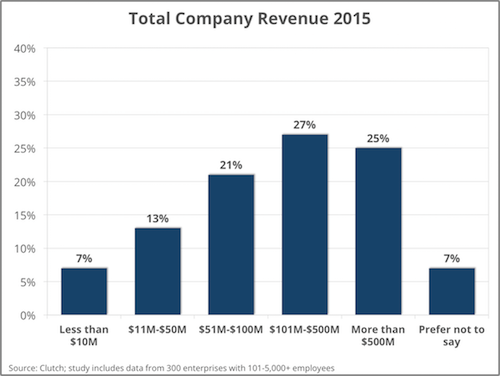 Clutch surveyed IT professionals at medium and large enterprises in the US to determine the value of cloud computing in the enterprise market. Security dominated the discussion and pervaded three topic areas: cloud benefits, challenges, and implementation. 64% of enterprises consider cloud infrastructure a more secure alternative to legacy systems. 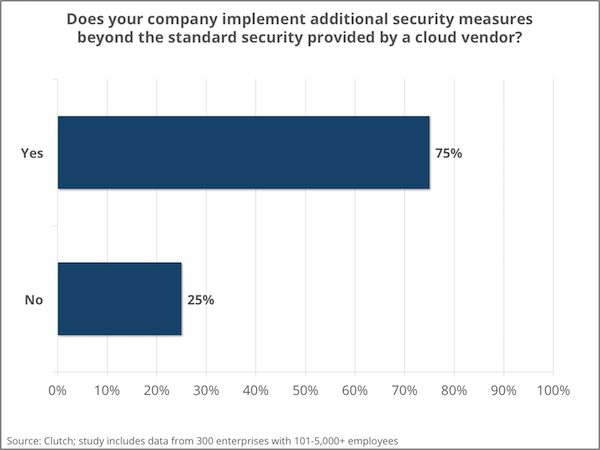 Enterprises voice mixed feelings about cloud infrastructure security, naming it both the primary benefit and challenge. 75% of enterprises implement additional security measures beyond what the cloud service providers offer, suggesting cloud infrastructure is not secure enough on its own, out-of-the-box. The additional security measure enterprises implement the most is data encryption (61%), followed by identity access policies (52%) and regular audits (48%). 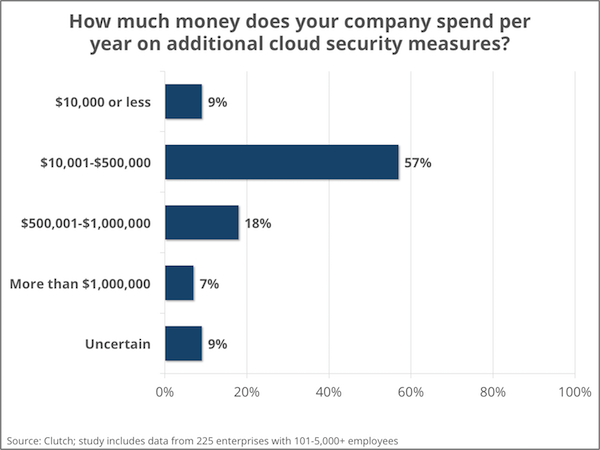 Implementing additional cloud infrastructure security is costly, with more than half of enterprises (57%) spending between $10,000 and $500,000. 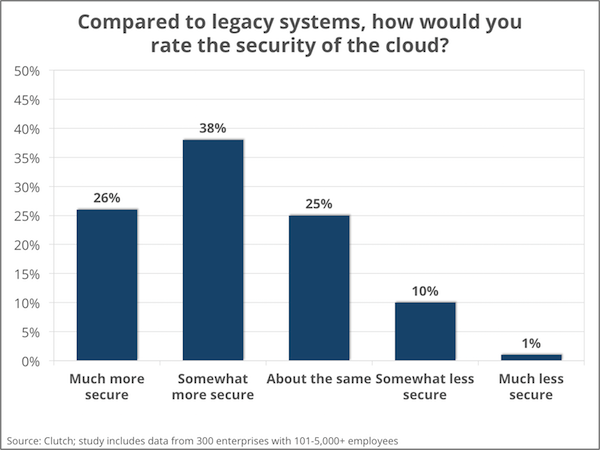 The level of enterprise trust in cloud security is encouraging but should be higher, according to David Linthicum, senior vice president of Cloud Technology Partners. Distrust of the Cloud derives from a lack of knowledge about the safeguards that exist to secure data and the circumstances that lead to data breaches. In reality, security problems often arise from human error, rather than shortcomings in cloud infrastructure. Many features differentiate cloud infrastructure from legacy systems and make it a more secure option for enterprises. 1. Cloud infrastructure is monitored at all times. 2. Security measures are multi-faceted. They include identity-based management, data encryption, compliance and standards, sophisticated governance systems, and proactive management structures. Companies that migrate to the Cloud actually become more secure because the change forces them to consider security at the application level, instead of just at the perimeter. 3. Central management of cloud infrastructure ensures security systems remain up-to-date at all times. Cloud computing services are audited on a yearly basis. However, this is not the case with on-premise solutions. Security is the primary benefit cloud infrastructure provides enterprises (21%), followed by increased efficiency (15%) and access to space for data storage (12%). 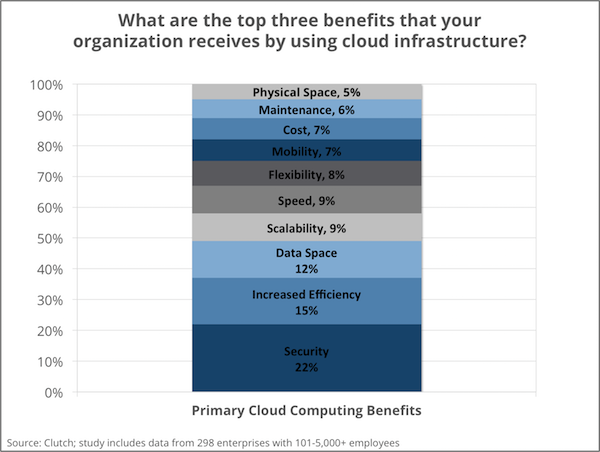 To determine the primary benefit of cloud computing, we asked respondents to rank a list of features from one to three, with one being the most important benefit cloud infrastructure provides. Respondents identified security as their number one cloud computing benefit. Cloud infrastructure’s proactive monitoring and response systems are a boon when it comes to keeping data safe. Cloud services dedicate around-the-clock resources to maintaining the security of data stored on cloud infrastructure and responding to breaches. Industry leaders highlighted alternative benefits of cloud computing, which they believe outweigh security, including scalability, speed, and increased efficiency. Although enterprises identified security as the primary benefit of cloud computing, 31 percent also deemed security the most prevalent challenge they encountered in 2015. Why is security both a benefit and challenge with cloud systems? The theory suggests that migrating to the Cloud raises awareness about the breadth of crucial information being stored on the platform, which in turn triggers a demand for more security measures. Another explanation posits that security seems a challenge when companies are unsure of how to implement cloud infrastructure or how to determine the best cloud solution for their needs. 75 percent of enterprises implement additional security measures beyond what a cloud computing service provider offers. The trend emphasizes the importance of taking all steps possible to ensure security, instead of relying on the cloud vendor alone. Migrating to the Cloud encourages companies to engage in better security practices overall. The additional security measure enterprises implement the most is data encryption (60%), followed by identity access policies (52%) and regular audits (48%). To implement additional cloud security, more than half of enterprises (59%) spend between $10,000 and $500,000. It is necessary to implement additional security measures for two reasons. The Cloud Security Alliance (CSA) received the most attention in the enterprise cloud computing market, with 39 percent of enterprises indicating it is necessary for cloud computing. For enterprises, being compliant to the necessary regulations and standards ensures better cloud implementation. 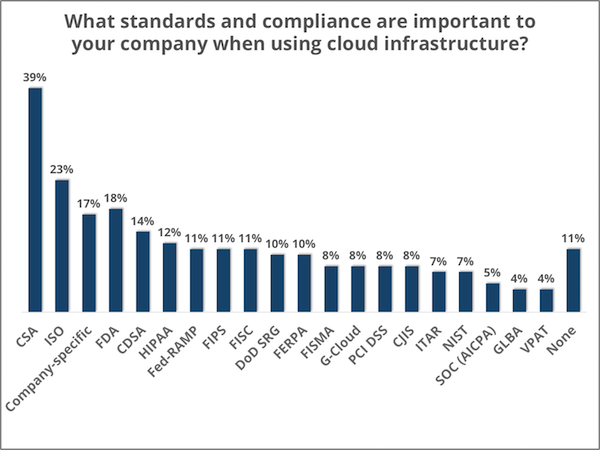 However, some enterprises still see compliance as a deterrent to cloud usage. If compliance can be not only a deterrent to cloud computing but also a necessary security measure, how should enterprises approach the process of becoming compliant? 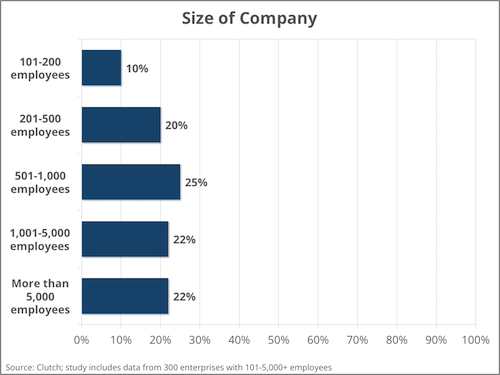 The study consisted of 300 respondents with decision-making authority or influence in the IT department, in companies with more than 100 employees. All respondents use a full-service cloud computing platform. The survey was conducted throughout December 2015. To request additional information or provide feedback on this survey, contact [email protected].